Ethan Goldberg, MD, PhD, is a pediatric neurologist at Children's Hospital of Philadelphia. Dr. Goldberg is attending physician and instructor of Neurology in the Division of Neurology at CHOP and Department of Neurology at The Perelman School of Medicine at The University of Pennsylvania. He sees patients in General Neurology Clinic as well as in Neurogenetics Clinic. Clinically, Dr. Goldberg has a particular interest in developmental delay, intellectual disability, autism, schizophrenia, and epilepsy, and the genetic basis of these disorders/diseases. In the laboratory, Dr. Goldberg studies mechanisms of brain circuit function and of circuit dysfunction in epilepsy, with the goal of translating these insights into the preclinical development of novel anti-epileptigenic and anti-epileptic treatment strategies. 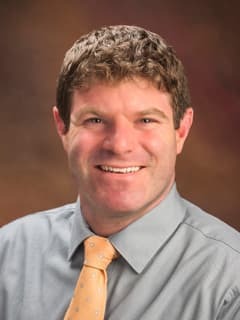 Dr. Goldberg employs large-scale dynamic imaging of neuronal circuits, including two-photon laser scanning microscopic imaging using calcium-sensitive dyes in vitro and in vivo, to facilitate the dynamic assessment and manipulation of network activity in normal and epileptic brain circuits. He is also using optogenetic and chemicogenetic techniques, including in combination with multicellular calcium imaging, and applying these techniques to answer epilepsy-related questions in experimental systems, including in animal models of acquired and genetic epilepsies. Charsar BA, Goldberg EM. Polymicrogyria and Intractable Epilepsy in Siblings With Knobloch Syndrome and Homozygous Mutation of COL18A1. Pediatr Neurol. 2017 Nov;76:91-92. doi: 10.1016/j.pediatrneurol.2017.08.003. Epub 2017 Aug 15. Ortiz-Gonzalez X, Goldberg EM, Banwell B. Obituary: Jessica Anne Panzer, MD, PhD. Pediatr Neurol. 2017 Oct;75:4-5. doi: 10.1016/j.pediatrneurol.2017.07.007. Epub 2017 Jul 14. Tian G, Cristancho AG, Dubbs HA, Liu GT, Cowan NJ, Goldberg EM. A patient with lissencephaly, developmental delay, and infantile spasms, due to de novo heterozygous mutation of KIF2A. Mol Genet Genomic Med. 2016 Sep 28;4(6):599-603. eCollection 2016 Nov.
Sharma S, Kalish JM, Goldberg EM, Reynoso FJ, Pradhan M. An Atypical Presentation of a Male with Oral-Facial-Digital Syndrome Type 1 Related Ciliopathy. Case Rep Nephrol. 2016;2016:3181676. doi: 10.1155/2016/3181676. Epub 2016 Aug 29. Tyson JA, Goldberg EM, Maroof AM, Xu Q, Petros TJ, Anderson SA. Duration of culture and sonic hedgehog signaling differentially specify PV versus SST cortical interneuron fates from embryonic stem cells. Development. 2015 Apr 1;142(7):1267-78. doi: 10.1242/dev.111526. Goldberg EM, Coulter DA. Seizing the opportunity: stem cells take on epilepsy. Cell Stem Cell. 2014 Nov 6;15(5):527-8. doi: 10.1016/j.stem.2014.10.017. Epub 2014 Nov 6. Bearden D., Strong A., Ehnot J., DiGiovine M., Dlugos D., Goldberg E.M.: Targeted treatment of migrating partial seizures of infancy with quinidine. Ann Neurol (Epub ahead of print), 2014. Zhou J., Goldberg E.M., Leu N.A., Zhou L., Coulter D.A., Wang P.J. : Respiratory failure, cleft palate and epilepsy in the mouse model of human Xq22.1 deletion syndrome. Hum Mol Genet (Epub ahead of print), 2014. Matalon D., Goldberg E., Medne L., Marsh E.D. : Confirming an expanded spectrum of SCN2A mutations: a case series. Epileptic Disord 16:13-18, 2014. Goldberg E.M., Titulaer M., De Blank, P.M., Sievert A., Ryan N.: Anti-N-methyl-D-aspartate receptor mediated encephalitis in infants and toddlers: Case report and review of the literature. Pediatr Neurol 50:181-184, 2014. Turkeltaub P., Goldberg E.M., Postman-Caucheteux W., Palovcak M., Quinn C., Cantor C., Coslett H.B. : Pure alexia due to ischemic stroke of the visual word form area. Neurocase 20:230-5, 2014. Goldberg, E.M., Coulter, D.A. : Mechanisms of epileptogenesis: A convergence on brain circuits. Nat Rev Neurosci 14:337-49, 2013. Lang S.S., Goldberg E., Zarnow D., Johnson M.P., Storm P.B., Heuer G.G. : Case Report: Prenatal diagnosis of hemimegalencephaly. World Neurosurgery (Epub ahead of print), 2013. Goldberg E.M.: Fever and bulging fontanelle in a 7-month-old due to transient intracranial hypertension of infancy. Pediatr Emerg Care 29:513-514, 2013. Abend, N.S., Wusthoff, C.J., Goldberg, E.M., Dlugos, D.J. : Electrographic Seizures and Status Epilepticus in Critically Ill Encephalopathic Neonates and Children. Lancet Neurol 12:1170-1179, 2013.